Every year on October 27, people in Indian-administered Kashmir switch their social media profiles to an all-black image with message, big and bold: "Black Day in Kashmir." They observe a day-long shutdown. Traffic remains off the roads. Schools, colleges, shops and other institutions remain closed. Throughout the day, you can see the frustration and anger on social media, with popular slogans reading: "Go Indian, Go Back", "We Want Azadi ['Freedom')", "Solve Kashmir Issue", "Free Kashmir", "O Tyrants! O Tormentors! Quit Our Kashmir", and so on. But why? It was on this day in 1947 that gun-toting Indian soldiers landed in the picturesque Kashmir valley. 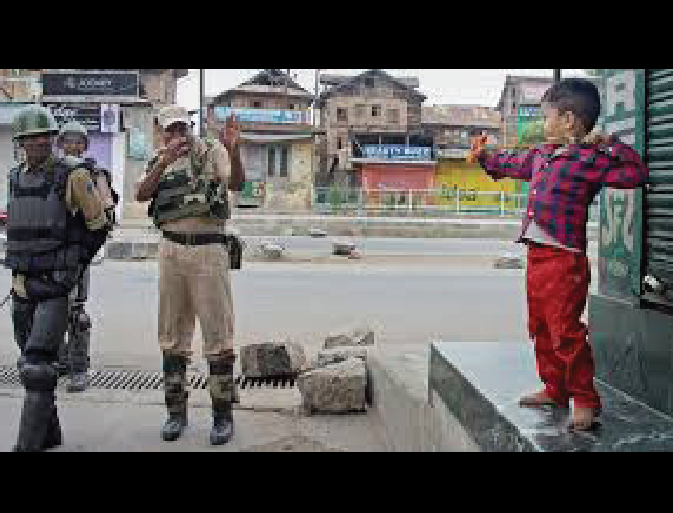 Kashmir has, ever since, witnessed a build-up of Indian military personnel, especially since late 1989, when the armed insurgency erupted against Indian rule - making Kashmir one of the most militarised and deadliest regions in the world. In the past 71 years, the death toll has surpassed more than 70,000 lives, with thousands more "disappeared", and yet more thousands having lost their eyesight due to the indiscriminate nature of the Indian military's shot-gun pellets. Hundreds, if not thousands, are still languishing in jails across India. The number of unmarked graveyards in Kashmir most plainly conveys the brutal past faced by the people of this valley. Senior citizens of Kashmir who were young in 1947 told The New Arab they had not known about the Indian military arrival when it first happened. "We didn't have radio, newspaper or any other media. The news about the Indian military arrival spread later among the general public, randomly, from person to person," he said. "But nobody was aware when and why India sent their armed troops to Kashmir. People were in the belief that the Indian army came here tentatively and they would leave very soon - and that never happened." When the process of decolonisation dismantled imperial rule in Asia, many territorial disputes remained unresolved and later erupted into deadly conflicts. Kashmir is one among them. In mid-August 1947, India and Pakistan came into existence after gaining independence from British rule. At that time Kashmir was one of those princely states which were not a part of British India. India and Pakistan fought their first war over Kashmir in October 1947 when tribesmen from the North West Frontier Province of Pakistan invaded the valley. On the request of Maharaja Hari Singh - the last maharaja ruler of Kashmir who was already facing internal agitation against his "autocratic" rule - India sent armed troops, who landed in Kashmir on October 27. Indian officials later said they had signed an "instrument of accession" with the maharaja before sending their armed troops to Kashmir. But most Kashmiris - particularly separatist leaders - reject India's claim. They say the maharaja had never signed any permanent accession with India and as such India had no right to decide the future of the Kashmiri people. The Quit Kashmir movement against "despotic" maharaja rule was already in full strength by 1947. "October 27 is a fundamental manifestation of the coercive nature of Indian rule in Kashmir," a Kashmir-based research scholar told The New Arab on condition of anonymity. "In all its bareness, it was a military invasion because the wishes of the Kashmiri people were not ascertained by the Indian leaders while making the decision to send in the army. "The maharaja might have been consulted, but he was facing popular internal revolt at the time, so it is questionable whether his decisions reflected the will of Kashmiri population. "And in any case, the right to self-determination of people is inalienable. It has been seven decades and we still didn't get a chance to exercise that right. That's why you see a lethal conflict raging across the region." On November 2, 1947, India's first prime minister, Pandit Jawaharlal Nehru, promised the people of Kashmir the right to self-determination in an address on All India Radio. "We have declared that the fate of Kashmir ultimately has to be decided by the people. That pledge we have given, and the Mahraja Hari Singh has supported it, not only to the people of Kashmir but to the world. We will not, and cannot, back out of it," he announced. In a later speech, Nehru promised the people of Kashmir: "We have suggested that when people of Kashmir are given a chance to decide their future, this should be done under the supervision of an impartial tribunal such as the United Nations organisation." In 1948, India took the Kashmir case to the United Nations. The UN passed a resolution on Kashmir, calling on India and Pakistan to withdraw their armies and to hold a referendum in Kashmir. "The question of the accession of the state of Jammu and Kashmir to India or Pakistan will be decided through the democratic method of a free and impartial plebiscite," the UN resolution reads. Despite this seemingly obvious solution through the right to self-determination, India and Pakistan, both now nuclear states, continue to claim the region in full. They have fought three wars over it. "October 27 is seen as a symbolic day when the Indian army landed in Kashmir and laid the formal foundation for India's military hold of Kashmir," said Ather Zia, an assistant professor in anthropology at the University of Northern Colorado. "On the other hand, it is also important to remember that the Indian army's Patiala men were already present on Kashmiri soil on October 17, 1947. That is before they formally arrived from India at the Dogra Maharaja's behest. "Even though Kashmir's history especially since 1947 stands distorted in the Indian narrative, Kashmiris are harkening back to the UN resolutions time and again to remind the world that it this is an international dispute that needs to be solved - with Kashmiri political will at its centre. Nothing can happen without Kashmiris." In June this year, the OHCHR, the United Nations human rights office, released the UN's first-ever report on human rights violations in Indian-administered Kashmir and Pakistan-administered Kashmir. Focusing on the urgent need to address past and ongoing human rights violations and abuses and to deliver justice for all people in Kashmir, the report stated that the people of Kashmir had been suffering for seven decades in a conflict that had claimed and ruined lives. "The political dimensions of the dispute between India and Pakistan have long been centre-stage, but this is not a conflict frozen in time. It is a conflict that has robbed millions of their basic human rights, and continues to this day to inflict untold suffering," said then UN High Commissioner for Human Rights Zeid Ra'ad al-Hussein. Welcoming the UN report, almost everyone in Kashmir termed everything published in the report a truth. However, the Indian government rejected the report, calling it "fallacious and [politically] motivated". Even some Indian national journalists declared the UN report "biased". In September, the new UN High Commissioner for Human Rights, Michelle Bachelet, in her opening statement to the council, said the commission's report on Kashmir "has not been followed up with meaningful improvements". Ather Zia agreed. "The intense Indian military presence is symbolic of the siege and occupation, and has led to Kashmir becoming one of the most intensely militarized regions," said the academic. "Human rights violations which have been documented in the recent OCHCR report manifest the gravity of what Kashmiris are undergoing." India has frequently rejected UN calls for establishing a commission of inquiry to conduct a comprehensive independent international investigation into human rights violations in Kashmir. Aamir Ali Bhat is a Kashmir-based freelance journalist who reports on human rights abuses, culture and the environment. He writes for The New Arab, Kashmir Ink and Free Press Kashmir.